Learning a foreign language is a steep mountain to climb. Along the journey, it’s important to get your ESL students to research English grammar and vocabulary independently or you, the TEFL teacher, will have to push everyone up the incline alone (and probably burn out in the process). There internet is full of TEFL sites where your EFL students can find information, practice their comprehension and even do a grammar quiz or two. Here are some of the best ESL ways to learn English for free on the internet. The BBC cottoned on to the popularity of English as a second language about 10 years ago. It now provides reading material, podcasts and activities for EFL practice for teens and adults. The British council provides grammar and vocabulary video lessons, business English and IELTs practice for English students. It’s teens site is particuarly good with videos and listening practices based around teen issues. ENGVID provides bite-sized video lessons on most aspects of English grammar and vocabulary. It’s a great way to recap on a ESL grammar class. If your students want to do any of the Cambridge exams such as PET, FCE, CAE or IELTS then point them to Flo-Joe. Flo-Joe provides previous exam papers for your students to practice, as well as, exam vocabulary activities so help your ESL students memorise useful words. For your richer students, they also offer paid-for services such as writing critique and correction and other exam assistance programs. Podcasts in English provides hundreds of podcasts for English learners for beginner, intermediate and upper-intermediate level. Accent: British. Duration: Five minutes. Provides vocabulary-focused podcasts together with a transcription. Accent: British. Duration: Six minutes. Business English Podcast Upper-intermediate to advanced. Provides topical business podcasts for English learners. Accent: American. Duration: 20 minutes. Provides thousands of videos about technology, education, politics, science and more. It’s a great way for advanced students to practice their comprehension. Accent: International. Duration: Five-20 minutes. Splendid speaking Intermediate to advanced. 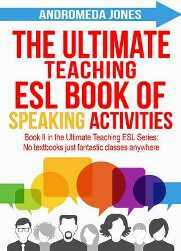 If you’re teaching an IELTS class this year then check out splendid speaking. Podcasts last 10 to 20 minute and include interviews with IELTS teachers who provide tips on how a student can increase their mark on IELTS speaking exam. Other podcasts include example speaking exams with real students to give listeners more ideas on how to answer questions. Nowadays in the age of MOOCS (massive open online courses), your students can brush up on their grammar by doing an entire course for free. Coursera offers English grammar and business English courses from US universities for free. Your students will need to be motivated though because a typical course lasts 60+ hours. Future learn is another big free course platform. Are your students going to do the IELTS exam this year? Why not direct them to this free IELTS prep course. Most Udemy courses aren’t paid-for but there are around 70 English grammar and vocabulary courses on the platform which are permanently free. Udemy courses are made by individual instructors rather than big universities and often include animations and self-learning tasks. Your students may find them less dry than a MOOC. We also have a free one hour course up on the platform. English Grammar Intermediate: Pronouns and conjugations, which I encourage you to check out. OK, so this book isn’t free. But it is good value for money. Let’s be clear. This book is hard, really hard. However, for students who have already reached a high-level of English, Practical Everyday English provides a rich insight into the way native speakers really speak. This book contains pages of phrasal verbs, adjectives and phrases, taught with hundreds of everyday examples to help your students decipher the meanings. Too often we English teachers teach standard English and neglect to teach the verbs and phrases we use every day. If your students wish to live in an English speaking country, they will need to at least understand these phrases, to communicate properly. I have read plenty of English language text books in my time, and I have not once seen the very British phrase ‘to have a go at someone,’ mentioned in their pages, and yet we use this phrase every day. It’s a tough book but if you’re students have reached a B2-C1 level they will get a lot from it. For more resource sites go to: The best ESL homework ideas that require no-marking. 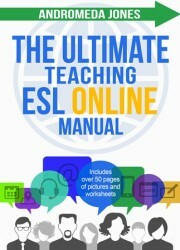 For more ways to teach every grammar point, as well as vocabulary lists, games, speaking practices, homework ideas and more, check out our 325 page book, The Ultimate ESL Teaching Manual. 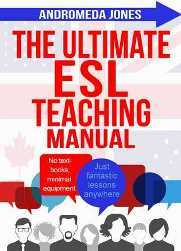 So, what are your favourite ESL resource sites? Leave a comment below.